The 385-C2 is a Level 4 / P-5 High Volume Office Crosscut shredder with big features. Designed to shred large quantities of paper, this high capacity cross cut shredder is equipped with a 24 Hour Continuous Duty motor for long shredding operations without timed cool down periods typical of most shredders on the market. Carbon hardened steel gears and a Heavy Duty Chain make for an All Metal Drive System that uses no internal nylon or plastic gears as is common in lower quality shredders. Easily handles paper clips and staples. The 385-C2 features Auto Start/Stop operation and includes an Energy Smart System for Zero power consumption in Stand-By mode. Automatic Reverse System to prevent jamming and Automatic Stop with light indicator for Bag Full and Door Open conditions. 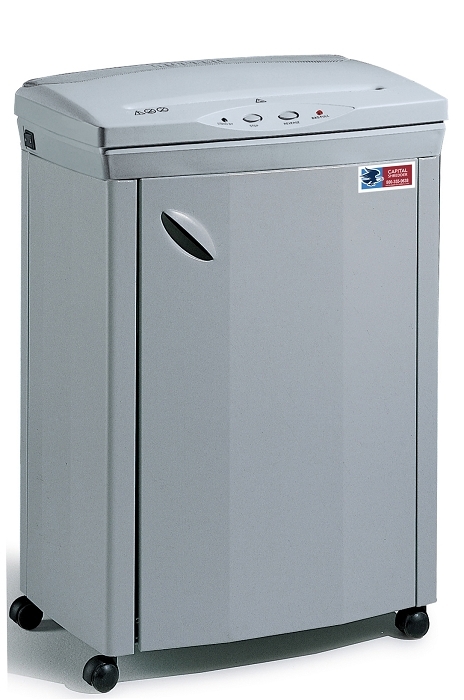 An attractive high quality all steel cabinet on casters for easy mobility.